I've seen that little 5 axis machine before. It looks surprisingly good! I've done it as a link to a large JPG here http://www.caswa.com/images/forums/proto.jpg so you can zoom in and see the detail. 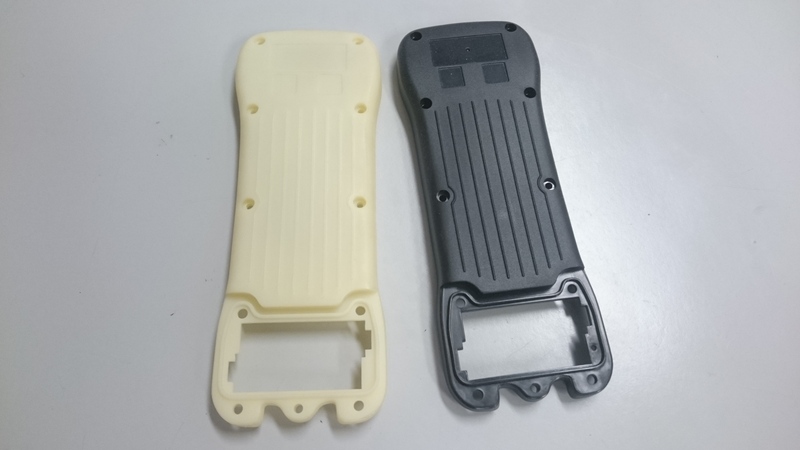 The black part is from the injection mould tool we went on to make after we were happy with the fit of the part on the left which was machined from ABS. Very nice design work on that part PK, can you give me a clue on dimensions. I look to breaking complex designs up into smaller parts then reweld them back to single parts. I assume some nice internal moulded detail so maybe produce this as two shells, inner and outer to get best surface finish on both sides. I would love one of those 5 axis desktop cnc's, on my wish list if someone pays me an obscene amount for one of my designs. The black part was done on a commercial injection moulding machine using a tool made from tool steel. The tooling cost was about $AU2500 as I recall, which is pretty good, but still worth AU$100 to get the prototype machined first, just to be sure. We've done two part tooling in silicone, you pretty much have to use a non gassing resin (ie anything cured with MDI is out of the question) unless your part geometry is very simple. Silicone molding is pretty easy to set up for. You can do it without any special tools, although a vacuum/pressure pot is really helpful. Yikes, only AU$100 for the 5 axis machining. Thats really good value compared to 3D printing, not much in the cost, but a world of difference in quality. Sorry, I didn't answer your question.